The wok is a brilliant piece of basic engineering, a deceptively simple utensil that's superbly efficient at its task. Designed to take maximum advantage of minimal cooking fuel, its bowl-shaped bottom rapidly heats oil or water to an optimal cooking temperature. In the case of broccoli, for example, in just minutes, you can stir-fry your florets, steam them to jade-green delicacy or deep-fry them to a satisfyingly crunchy texture. Slice the head from the stalk of broccoli and break the florets apart, and then use a paring knife or chef's knife to cut them further into bite-sized pieces. Use long, diagonal cuts on the stem ends, so the greatest possible surface area is exposed to the hot oil. Heat the wok over a medium-high burner. When the air inside the wok feels hot to your hand and the air smells faintly of hot metal, pour 2 to 3 tablespoons of oil into the wok. Swirl the oil, so the woks' entire cooking area is lightly coated with oil. Add a cup or two of broccoli to the wok. With a spatula or long chopsticks, stir the florets rapidly so that they all pass frequently though the hot bath of oil. It's the oil, not the heat of the wok itself, that cooks the vegetable. Stir-fry the florets for 2 to 4 minutes, depending on their size, until they're a glossy, vivid green and delicately tender-crisp when you bite one. Add a splash of sauce, if desired, when they're nearly done. Scoop the broccoli from the wok with a slotted spoon if it's plain or a serving spoon if the florets are bathed in sauce. 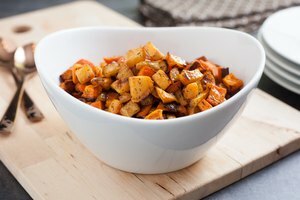 Serve on its own as a side dish with a larger meal or over rice with stir-fried meats, tofu or other vegetables. Cut or break the broccoli head into mid-sized individual florets, and set them aside. Place a round bamboo steamer in the wok, and mentally note how far up the wok's side it rests. Pour enough water into the wok to come within 1/2 to 3/4 inch of the steamer's level. Replace the steamer in the wok and bring the water to a boil. Mound the florets loosely in the steamer and cover it with the steamer's lid. 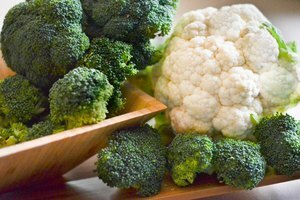 Steam the florets for 5 to 7 minutes or until the broccoli reaches your preferred level of tenderness. Scoop the broccoli carefully from the steamer with a slotted spoon or remove the wok from the burner and lift it out of the steamer with oven mitts. Serve the broccoli hot with a sprinkle of toasted almonds or sesame seeds, a drizzle of toasted sesame oil or a simple pat of butter. 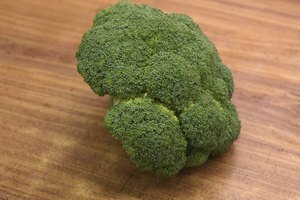 Separate the broccoli into mid-sized florets, by either cutting them away with a paring knife or simply breaking them with your fingers. Pour enough oil into the wok to bring it to a depth of 3 to 4 inches at the deepest point. Because of the bowl shape, it's much less than you'd use in a conventional pot or saucepan. Heat the oil to a temperature of 360 to 370 degrees Fahrenheit when tested with a frying thermometer. Whisk cold water together with either cornstarch or rice flour to make a thin batter, approximately the consistency of light cream. Toss the florets in the batter until they're thoroughly coated, and then gently slide them one at a time into the hot oil. Cook only a handful at a time, so the oil temperature remains high. Stir the battered florets to prevent them sticking to each other or the wok and to ensure even cooking. Fry them until the batter is crisp, approximately 2 to 2 1/2 minutes. Test them by tasting one, since the batter won't develop the rich, golden color of Western-style fried foods. Drain the fried broccoli on several layers of paper towels and keep the florets warm while you prepare the remaining portions. 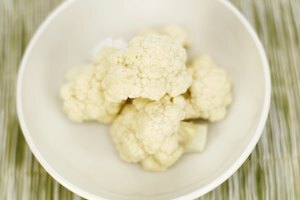 Serve as part of a larger Asian-themed meal or as an appetizer with an acidic or pungent dip. The broccoli stem is sweet and succulent in its own right and can be prepared alongside the florets or cooked separately. Use a paring knife to pull or peel the tough, woody skin from the juicy stem, and then cut it into matchsticks, thin slices or long, diagonal oblongs. The stem can be stir-fried or steamed in the same ways as the florets, though it's less appealing for deep-frying. Traditional bowl-shaped woks work best on a gas stove or an electric stove with a special wok-shaped coil. For ordinary electric stoves, a wok with a slightly flattened bottom is a better option. Quick cooking is the key to stir-frying, so if you need to prepare lots of broccoli do it in batches or use multiple woks. To lend flavor to the broccoli as it steams, mound it over a loose bed of aromatic ingredients such as green onions, grated ginger or bruised lemongrass stems. You can use any size steamer that fits into your wok, thanks to its sloped sides. 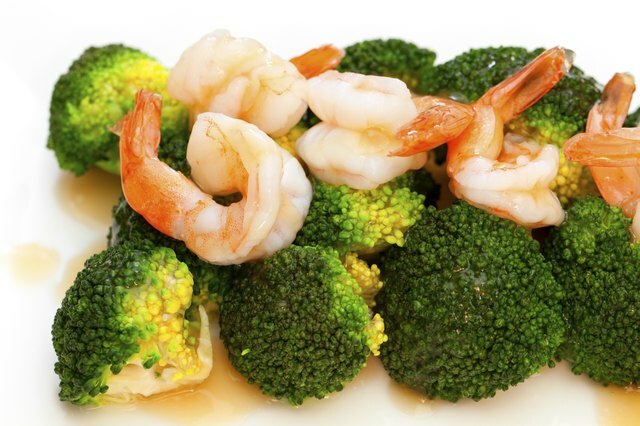 To cook other foods at the same time as the broccoli, either arrange them in separate mounds in a single large steamer or stack smaller steamers atop each other. The second method is preferable, enabling you to start with longer-cooking foods and then stack quicker-cooking broccoli on top. 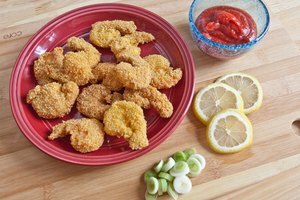 If you don't have a frying thermometer, heat your deep-fry oil until a small cube of bread browns within a minute. Traditional round-bottomed woks tip readily and require constant supervision, especially if children and pets are present or if you're working with hot oil over an open flame. Don't leave the wok unattended while in use.